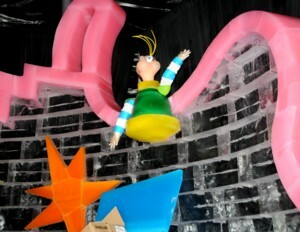 Ice Carvers from China Create Gaylord National’s ICE! featuring How the Grinch Stole Christmas! The welcoming portal to ICE! How the Grinch Stole Christmas! at the Gaylord National Resort in Washington DC © 2010 Karen Rubin/news-photos-features.com. You can easily imagine what it’s like for the elves at the North Pole when you peak inside the massive tents where 40 artisans from Harbin, China are at work in a 9-degree environment, creating all-new interactive ice sculpture world, “ICE! featuring How the Grinch Stole Christmas!” on view at Gaylord National Resort just outside Washington D.C. from Nov. 18, 2010 through Jan. 9, 2011. Working with 5,000, 400-pound blocks of colored ice, custom manufactured at an Ohio plant and shipped to the 15,000-square foot structure, over a six-week period the artisans create 10 life-sized scenes straight out of the pages of the original storybook, all sculpted into full-color, with amazing detail that bring the Grinch story about how he learns the true meaning of Christmas into three-dimensions. Chinese ice carvers work to create ICE! How the Grinch Stole Christmas! at the Gaylord National Resort in Washington DC © 2010 Karen Rubin/news-photos-features.com. The climax is a room with four two-story slides, entirely created of ice, which adults and children alike will delight in sliding down. I watched as they worked – some with chain saws, some with chisels, and some with fine tools – the designs laid out in a 250-page book. When they are done, they will have craeted these famous scenes: The Grich’s frozen lair Christmas Eve in Who-ville; The Grinch creating his “ramshackle” sleigh, complete with “reindeer” Max; Mount Crumpit – where visitors can climb to the mountaintop and zip down ice slides to Who-ville; The Grinch stealing Christmas from the Who houses; and Christmas morning in Who-ville and the famous Roast-Beast Feast! A work in progress: Chinese ice carvers work to create 10 life-sized scenes from How the Grinch Stole Christmas, this year's ICE! event at the Gaylord National Resort © 2010 Karen Rubin/news-photos-features.com. Some of the sculptures are illuminated internally by some of the exhibit’s specially designed LED tube lights, evoking the ice lanters of old Others are engineered to support thousands of visitors over the exhibit’s 50-day lifespan, such as the ice bridge in the snow forest, the towering Christmas Castle ice slides and the full-sized ice horse and sleigh. A sneak peak at ICE! How the Grinch Stole Christmas, which will be on view at the Gaylord National Resort during its "Christmas on the Potomac" festival © 2010 Karen Rubin/news-photos-features.com. A few of the artisans remain behind in order to touch up their sculptures nightly – a spritz of water here, and chisel there. 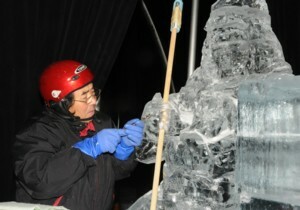 A master ice carver from Harbin, China, works on the Nativity scene in crystal clear ice that concludes ICE! at the Gaylord National Resort © 2010 Karen Rubin/news-photos-features.com. Some 185,000 people visited ICE! last year – 8,000 people a day – and more are expected this year. All four of the Gaylord Resorts have ICE! 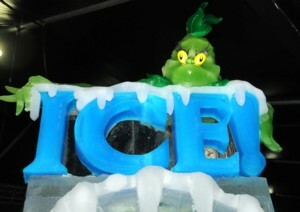 but they all have different shows – in Nashville, Gaylord Opryland’s ICE! 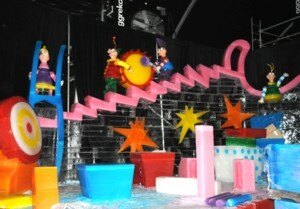 event is themed Santa Claus is Comin’ to Town®; the theme for the Gaylord Palms Resort in Orlando ICE! event is Twas the Night Before Christmas,and the Gaylord Texas Resort, in Dallas, has A Charlie Brown Christmas. And while there are other ICE! events in the world, these are the only ones in North America. ICE! is open daily (hours vary), and is priced at $24-29/Adults, $13-18 for Children 4m $18-23 for Seniors (ages 62+), $21/Military Adults and $13/Military Children. Tickets should be purchased in advance (since many popular days sell out) and can be purchased online at www.wefrozethegrinch.com; via phone at 301-965-4000; at the Gaylord Concierge Desk (Hotel Lobby) or ICE! Box Office (inside attraction). But why not make it a real holiday, and stay over? 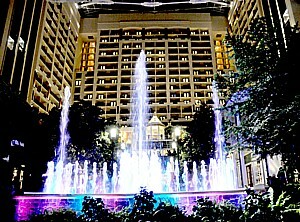 The Gaylord National is offering value packages for the Christmas Holidays which incorporate a visit to ICE! 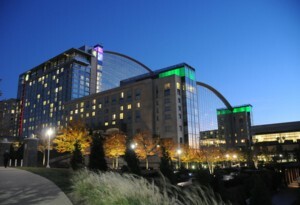 The “Christmas Memories” Package provides for one night deluxe room accommodations, one ticket to ICE! and a Souvenir ICE! photo (one per room), daily self-parking and resort fee (a $40 value), for $99 per person, double occupancy (extra adult and child rates are available) The package is available for select dates between November 2010 through January 2011. The “Grandparent Getaway” Package (because there is no better time than the holidays for grandparents to create lasting memories with their grandchildren), provides two nights deluxe room accommodations at Gaylord National Resort, one ticket to ICE! and a Souvenir ICE! photo (one photo per room), one ticket to Breakfast with The Grinch, daily self-parking and resort fee for $203 per person, double (with extra adult and child rates available). There are loads of other activities and entertainment that are all part of the Christmas On the Potomac festivities, and most are open to both resort guests and day visitors. For more information, to purchase tickets, or make dining reservations, visit www.ChristmasOnThePotomac.com; call 301-965-4000 or 866-9-GRINCH (866-947-4624). See more about Gaylord National’s “Christmas On the Potomac” at www.examiner.com/eclectic-traveler-in-long-island/karen-rubin.